Welcome to Canada! You will be met and transferred to your hotel. Meet your Tour Director and fellow travellers for a welcome dinner. Visit the world-famous Butchart Gardens, and afterwards enjoy an orientation tour of Victoria. Board the BC Ferry and travel through the Georgia Strait to Horseshoe Bay. Journey along the Sea to Sky Highway before arriving at Whistler Village. Travel the scenic Duffy Lake Road. In the afternoon arrive to the village of Sun Peaks. You’re Invited: Enjoy a fur traders feast and presentation accompanied by a canoe journey. Be rewarded with astounding views as you reach the Canadian Rockies and Jasper National Park. Enjoy a guided walk through Maligne Canyon, then travel along the breath-taking Icefields Parkway. Stop at the Columbia Icefield, and climb aboard the ‘Ice Explorer’ for a journey onto the Athabasca Glacier. Finish the day at your luxurious Rockies lodge on gorgeous Emerald Lake. Visit the famous ‘Diamond in the Wilderness’, beautiful Lake Louise. On arrival in Banff take a sightseeing tour then ride to the top of Sulphur Mountain for incredible views across the Rockies. Settle back in your SilverLeaf carriage on the Rocky Mountaineer train known as ‘The Most Spectacular Train Journey in the World’. Continue our journey passing through the Fraser Valley before arriving into Vancouver. You’re Invited: Travel to Grouse Mountain and see the resident grizzlies before a bear inspired breakfast. Afterwards set-off on a sightseeing tour of Vancouver. This morning board your luxurious cruise ship for a 7 night Alaskan Voyage in your included balcony stateroom on Royal Princess. Relax and soak in Alaska’s famous coastline. Ketchikan was known as Alaska’s first city. Today it’s known as the salmon capital of the world and visitors will be intrigued by its rich Native heritage. Surrounded by the Gastineau Channel, the Mendenhall Glacier and the Juneau Icefields, Alaska’s capital is famed for its scenery. Skagway is the gateway to the Klondike. Enjoy this town which is reminiscent of the gold rush era. Enter the iceberg strewn waters of Glacier Bay National Park which will be brought to life by a National Park Ranger. Within Prince William Sound lies College Fjord and its collection of towering glaciers. Disembark in Whittier and travel via the Alaska Wildlife Refuge to Anchorage. Have a brief orientation tour of Anchorage. You’re Invited: Visit the home of Iditarod (sled dog racing) champion Martin Buser and take a virtual trip along the Iditarod trail. Continue our journey to Denali. Discover More: Take a Denali scenic flight. Board our full dome rail car on the ‘Midnight Sun Express’ train and make our way to Denali. Tonight enjoy the Music of Denali Dinner Show. Explore the wilds of Alaska on a Tundra Wilderness Tour, which takes you into the park for a once in a lifetime experience. 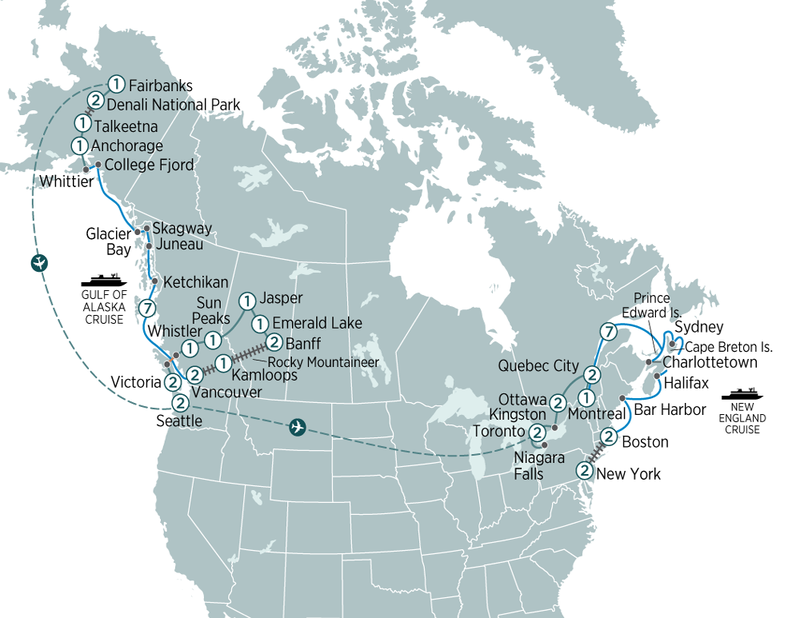 Continue to Fairbanks and cruise on an authentic stern-wheeler. Tonight, enjoy a farewell dinner. Transfer to the airport for your flight to Seattle (flight not included in land only bookings, day is unescorted).